French cuisine conjures images of cheese, buttery croissants, snails and many other not-vegan-friendly dishes. When a colleague’s French wife heard I was vegan and was about to visit Paris, she stated ‘oh, we are not very good with vegans’. Sitting on the Eurostar after passing the colourful macrons in St Pancras, I was hoping very much to find and eat some authentic vegan French food. 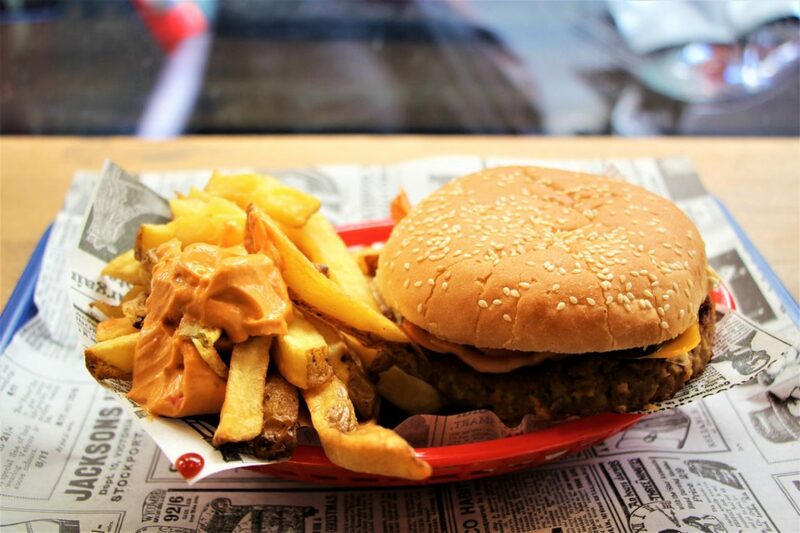 It tends to be easy in most capital cities in Europe to find vegan food as the vegan scene has exploded in the last few years. There always seems to be a pizzeria or a burger place to munch on some lovely veggie food. Yet would I be able to enjoy a fluffy French croissant? Would there be vegan versions of French delicacies? Would we find vegan restaurants in Paris? Below I have listed 7 vegan restaurants in Paris that Alex and I visited during our recent trip. There are also some vegan cafes listed amongst the vegan restaurants. I can happily report that we were able to enjoy wonderful vegan French food as well as indulge in some vegan junk food. Paris is vegan friendlier than you think. What do you think of when you think of Parisian food? Do you picture baguettes, macarons, croissants and other colourful pastries? Sadly, most of the above used to be off-limits to vegans with the French’s heavy helping of butter. Not anymore! 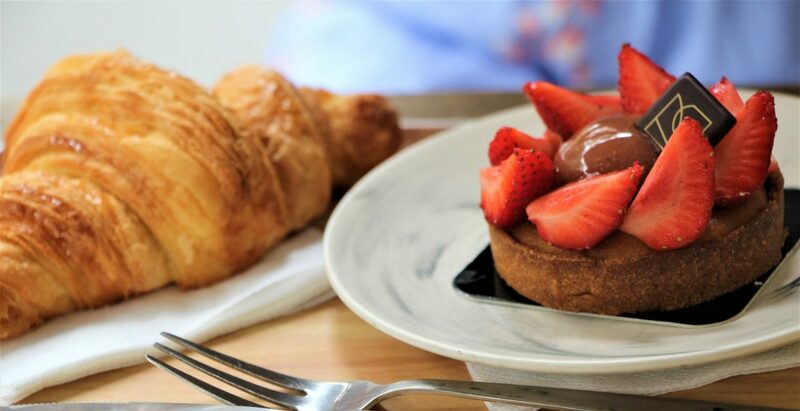 VG Pâtisserie offers vegans the chance to taste the many quintessential French treats. The counter inside the Pâtisserie displays a huge variety of brightly coloured cakes, tarts and treats. Each delicacy is a piece of art. Much care has been taken to create these breath-taking masterpieces. 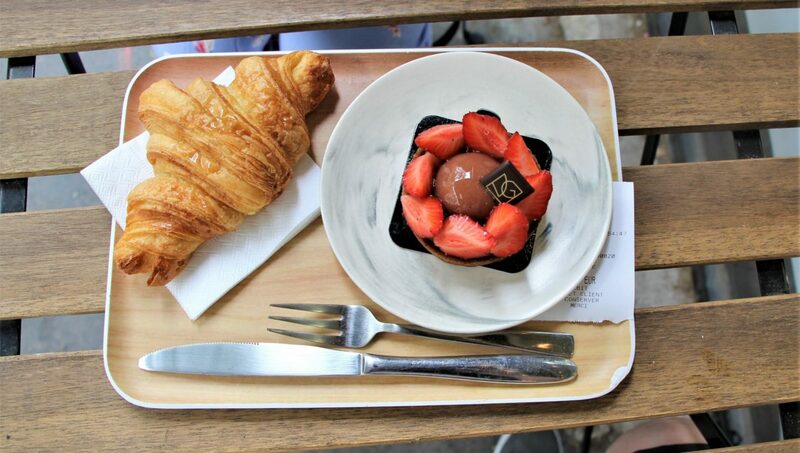 Unsurprisingly VG Pâtisserie can boast an impressive Instagram following of 19.6k Followers. What’s even more impressive is that each masterpiece tastes just as good as it looks. After taking a bite of the rhubarb tart, an explosion of flavours erupted on my tongue. The sharp rhubarb flavour was paired perfectly with the sweet gluten-free pastry. Alex and I felt we had both entered French vegan heaven. We also tried the very flaky croissant. It was perfectly crispy on the outside and fluffy on the inside. For traditional vegan and gluten-free pastries, you must visit VG Pâtisserie during your trip to Paris. 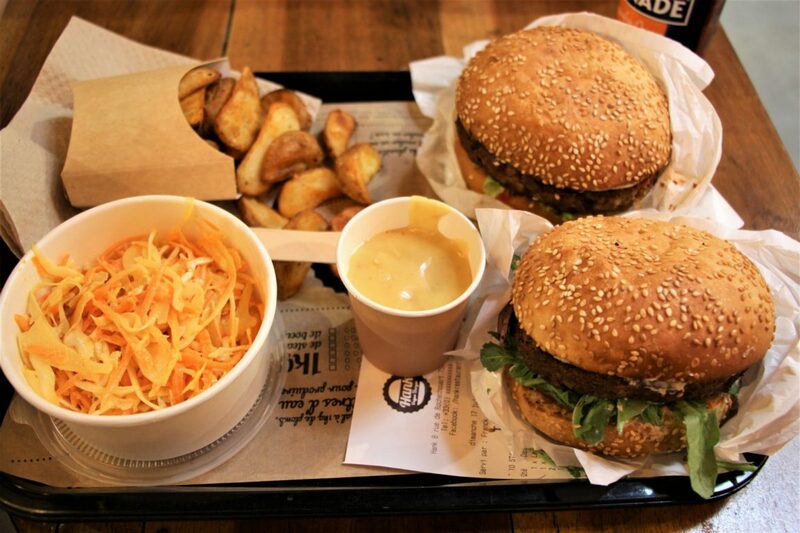 Imagine thick hot cashew cheese to dip your chips into and pour all over your burger. If for no other reason, you need to visit Hank burger for its incredible cheese! The burgers themselves are fantastic. The patty is meaty but still retains the elements of a classic veggie burger. There are 5 burgers to choose from including ‘the tourist’ which changes with the seasons. Also, don’t forget to try all of the epic unlimited sauces. There is a menu option to have a burger, a side and a drink for a reasonable price. 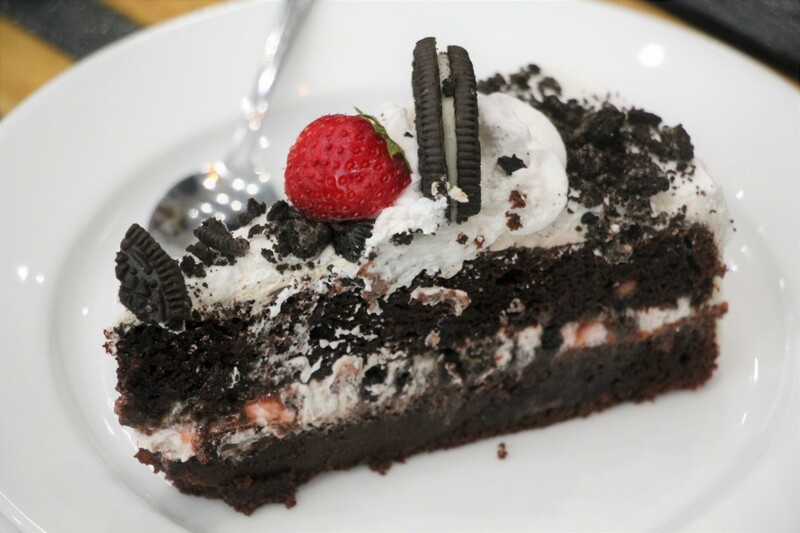 There are also some desserts on offer if you still have room after your giant burger! Visit on a very empty stomach and you will leave filling very very full! Quick, filling and good value. We entered Tian Hiang and were spoilt for choice! Most of the vegan places we had visited in Paris up to this point had a fairly limited selection of dishes. At Tian Hiang, there were over 30 different dishes to choose from! After long deliberation, we choose two. The food did not take long to arrive! Just a 5 – 10-minute wait and we both had steamy hot dishes in front of us. I cannot fault either of the dishes. The faux meat was excellent, and the curry was incredibly creamy. At under 10 euros a dish it was one of the cheaper vegan meals in the city. There also an even cheaper lunch menu. Make sure you visit Tian Hiang for delicious, good-value, vegan Chinese food. Who said you need an egg to make a cake rise? Cloud Cakes produces incredibly delicious and fluffy vegan cakes. 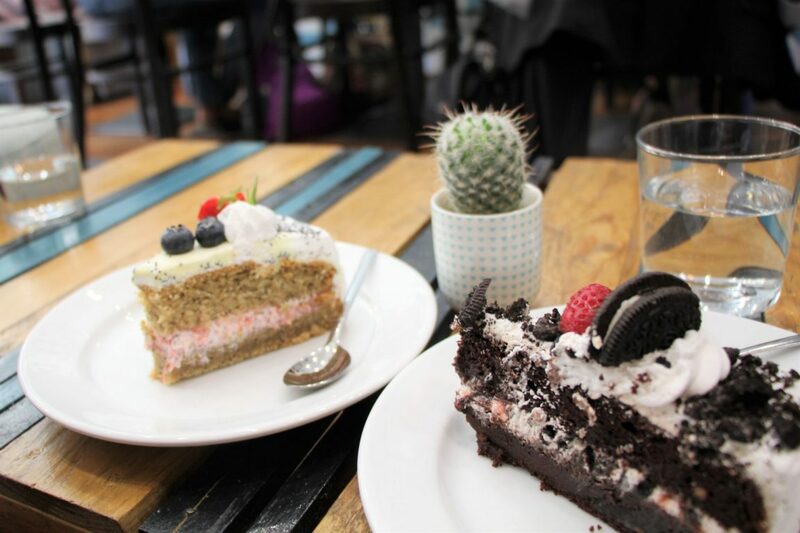 Set in a lovely blue café, Cloud Cakes is a nice place to sit a while and enjoy a slice (or three…) of vegan cake. 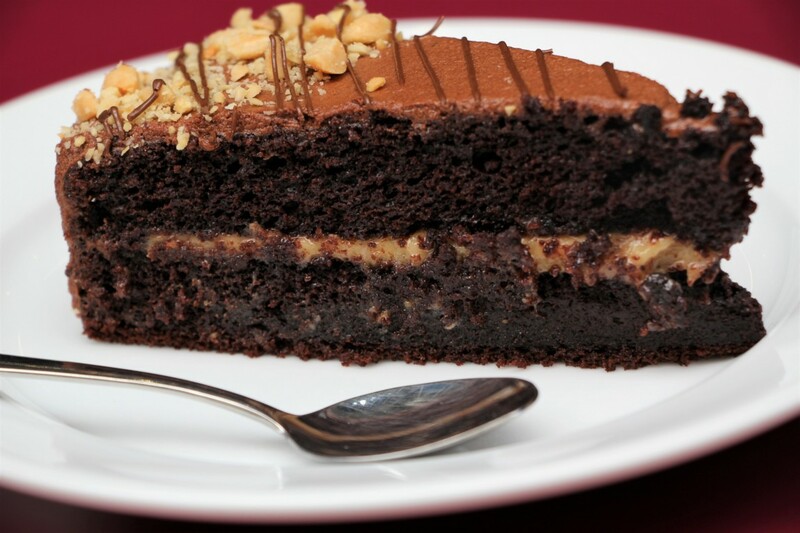 An incredible choice of decadent cakes are on display you will be spoiled for choice. We tried several. We managed to narrow our choices down to the peanut chocolate slice, the Oreo Black Forest Gateau and the Strawberry Chia Vanilla slice. They were all incredibly flavourful, creamy, decadent and delicious. Not only do Cloud Cakes make cakes but they also produce incredible vegan French croissants! It was very nice to have an authentic French croissant in Paris. Buy a few to take away so you can heat them up for breakfast the following day. There was a very relaxed atmosphere at Cloud Cakes. Some people had a book, others were chatting with friends, some were playing board games. Everyone seemed very happy. I mean when you are surrounded by so many wonderful vegan cakes why wouldn’t you be? Fancy a kebab? Look no further than Super Vegan. Its website is naturally superhero themed and its incredible kebab ‘meat’ lives up to its super high expectations. 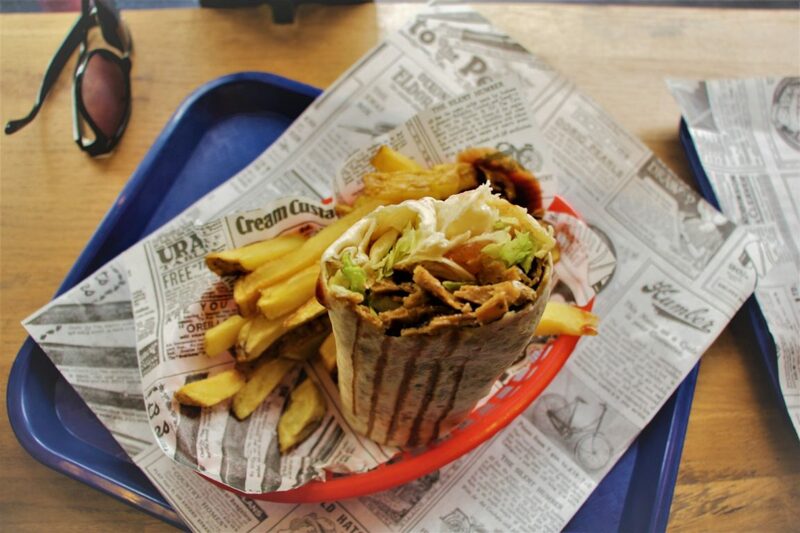 The Super Vegan Kebab is served in a pitta with a dip of your choice with piping hot chips on rustic newspaper. The seitan was cooked and seasoned to perfection. I also appreciated the thickly cut chips, rather than the typical thin fries fast food places usually serve, complete with crispy potato skin on the side. Whilst there is not a lot of choice, what they do serve, they do it well. We also tried their Super Burger which was just as nice! The huge patty was really yummy, especially with the spicy mayo dip. Cheap and yummy vegan junk food. 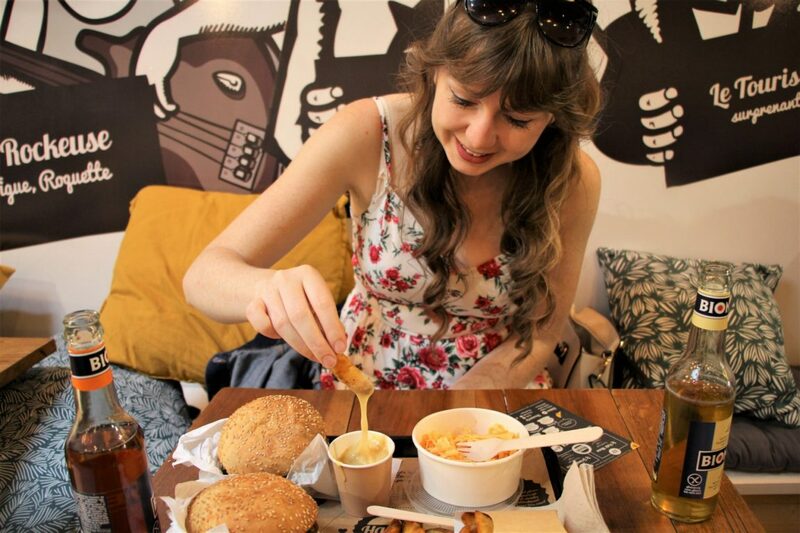 Head to the Jewish quarter to experience some of the best falafel in Europe. Sit inside and share a platter of hummus and falafel or stay traditional and grab a pita to go. Just make sure to take plenty of napkins with you if you choose option 2! Step into a welcoming interior. The gentlemen greats us as if he knows us, welcoming us in French then in English. This continues throughout the evening allowing us to experience the beautiful French language whilst ensuring our understanding. He kindly takes us to our seats, gentlemanly taking the chairs out. This was true French hospitality. La Potager du Charlotte is a vegan gourmet restaurant. Formed by two brothers who were sons of a hotelier and food photography. One brother a chef, the other a naturopath. Together the vegans accomplished their dream of opening their own restaurant with gourmet and plant-based cuisine. After all of the great vegan food we had tried in Paris, nowhere served us and attended to us with more warmth and care than at Potager du Charlotte. The food is obtained from local farmers’ markets and organic whenever possible. This also means their menu changes with the seasons. Both of our dishes were delectable. The risotto was particularly flavoursome. We also splashed out on dessert which turned out to be a worth well expense. I also wish we had come on a Sunday to try their brunch menu! Potager du Charlotte serves delicious food and delivers a wonderful experience. Book ahead and treat yourself to some incredible gourmet food and 5 start service. Would you like to visit any of the above? Let me know in the comments! And remember, sharing is caring! I’m not a vegan, but I would go to all of these establishments as they all look so delish. I love croissants and really love the photo you posted for Tian Hiang. That curry looks incredibly tasty! 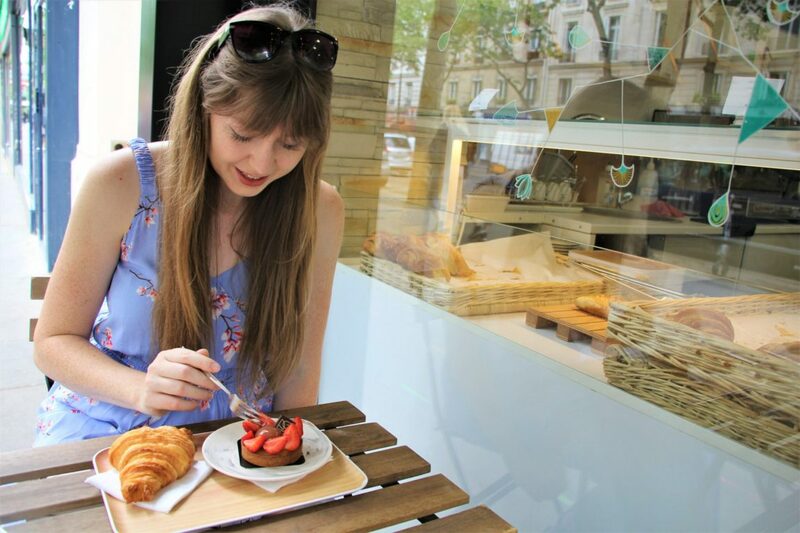 Me and Claire are always hitting up paris as its only across the water and as Claire is a vegan, she loves checking out the latest restaurants popping up on the vegan circuit. 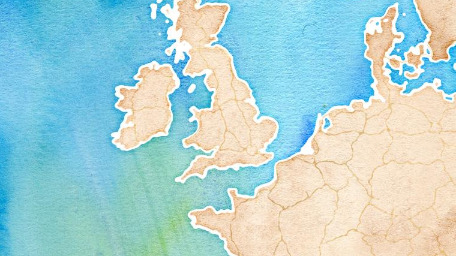 Have bookmarked this page so we can check out some of these on our next visit. This is great to know, I have heard that France can be a little difficult for veggies so it’s reassuring to know that there are some wonderful restaurants and what a variety too. I would love to try that curry and the burger! This post has been a real education for me. I had no idea vegan food could be so imaginative in Paris or anywhere else. It looks absolutely delicious and there is such a range. I am intrigued by cashew cheese! I have never heard of it but as I love cashews (and cheese, I am afraid) I would love to try it. I don’t think I would have been tempted to go into a vegan restaurant before, but having read your post and seen the wonderful pictures, I most definitely would now! Thanks for this compilation! Will check them out while I am still in Paris! Everything looks so delicious! I’m not vegan but I’m tempted to try all of these dishes. Wowie! I am ready to turn vegan, seeing all these tempting dishes on offer. On a serious note, vegetarian and vegan has much more flavor and variety than meats. Hands down. On our next Paris trip, I will try some of these places. Omg this is everything I want right now! Your description of the rhubarb tart got me salivating. Im so glad to hear there are vegan friendly places in Paris, even if you were told otherwise. I am saving this for when I finally go to Paris! 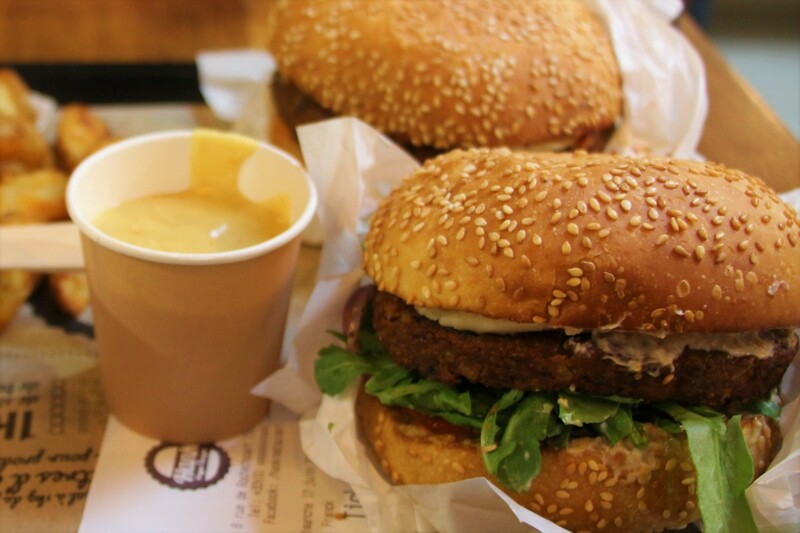 These Vegan restaurants are right up our alley as we are vegetarians. Never knew that there were so many vegan restaurants to choose from in Paris. We did have a hard time when we were there. The VG Pâtisserie looks really promising and the food on offer really enticing. 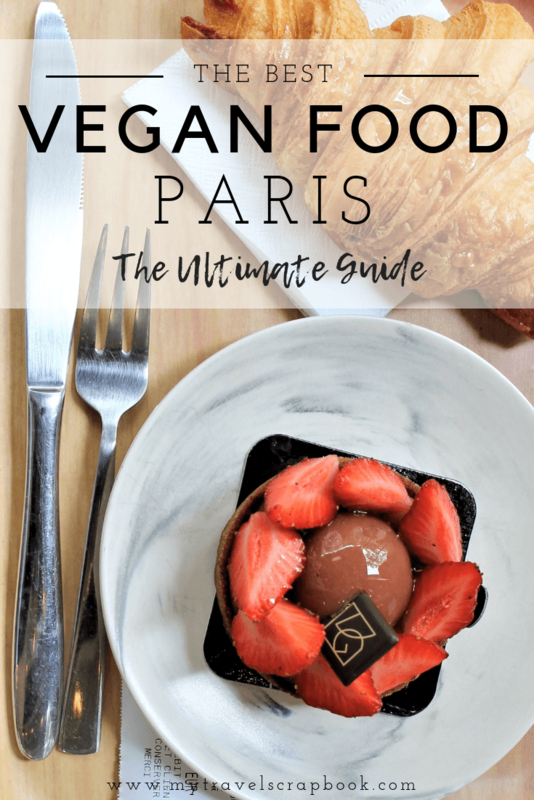 I am not a vegan and I don’t plan on being one but I have to admit I would definitely go to some of these places in Paris and try the food. A lot the food loos and sounds delicious for sure, I especially like Tian Hiang and Super Vegan. I would definitely be giving that kebab a go.